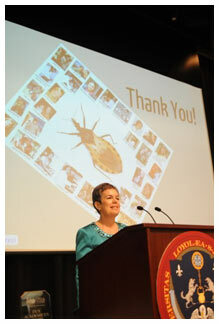 Loyola University New Orleans biology professor Patricia Dorn, Ph.D., published new research in The American Journal of Tropical Medicine and Hygiene highlighting methods that are vital to stopping the spread of the often fatal Chagas disease, a leading cause of heart disease in Latin America. Her research goes to the root of the problem—stopping the parasite-carrying bugs from living in and infecting people in their homes. The bug carrying the disease often feeds on victims’ faces at night, and infects from 8 to 9 million people in Latin America and also people in the U.S. In 20 to 30 percent of victims, it causes fatal heart disease. Dorn’s research offers approaches to improve people’s lives and health, in partnership with the affected communities, such as insecticide application combined with plastering walls and cementing bedroom floors, to protect people in Guatemala from the disease-carrying bug. When the techniques were used, the rate the bugs fed on human victims decreased from 38 percent to 3 percent. “It’s an interesting approach. People thought improving houses was too expensive, but we've shown it is cost effective and provides many health benefits, not just preventing Chagas transmission,” Dorn said.